Seabourn are an operator who took luxury cruising and decided they could improve upon it. And with a fleet of five fantastic all-suites small ships, which have a very favourable crew to guest ratio, they have definitely achieved their goal. The size of these vessels means that everybody has enough space to feel relaxed and enjoy themselves, but that each individual also gets to feel special and unique. The unimposing service leaves you wanting for nothing and the finer details have definitely received a lot of attention. And with unfamiliar destinations such as Antarctica and Patagonia on the list of places they visit, you can even experience superior comfort and service in the more extreme and isolated world regions. 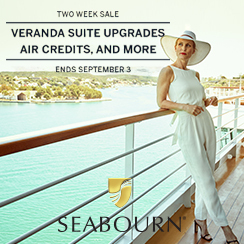 Seabourn’s brand of all-inclusive cruises is definitely another plus. Wines flow at dinner, bars and restaurants are open and invite you to drink and dine whenever and wherever you wish, and the award-winning staff are driven by a passion for excellent service and not the size of their tip. All of this can be summed up by the Seabourn microcosm that is their signature event of ‘Caviar in the Surf’; a beach barbecue during which champagne and caviar are served to guests from a surfboard in the ocean. Book any Penthouse or Premium Suite and receive up to $1,000USD Shipboard Credit per Suite on select sailings*. Seabourn’s six-star cruising is unlike any other experience at sea. Luxury and elegance lie around every corner but the atmosphere on board is still casual and understated. There are five ships in the fleet, perfectly designed to carry between 458 and 604 guests. The vessel are intimate yet spacious and have the benefit of being able to sail into ports and destinations that larger ships simply cannot reach. Life on board is a sumptuous affair, with fantastic service, gourmet dining options and carefully-chosen shore experiences all included in the price. You will be tempted to tip, but this is neither expected nor accepted. Simply relax amongst your glamourous surroundings and enjoy your holiday in style. Complimentary, award-winning gourmet dining venues that delight as much as the finest shore based restaurants. From the moment you step on board until the heavyhearted moment your holiday comes to an end, the Seabourn team will provide you with impeccable service. From drawing you a Pure Pampering SM lavender bath in your suite to the little touches like remembering your name and your cocktail of choice, the crew will enhance every moment or your cruise. Always there when you need them, but never overbearing, the attentive staff enjoy those personal moments that will stay with you and believe intuitive service is part of Seabourn’s way of life. Your home for the duration of your cruise will be a luxuriously appointed suite. Your eyes will be drawn to the spacious walk-in wardrobe and the large bathtub, whilst your body will appreciate the fine Egyptian cottons on the bed, the plush robes hanging in the bathroom and the Molton Brown toiletries. Anything else you need can be provided by your personal cabin steward who will ensure you enjoy the all-suite accommodation on board Seabourn’s ships. As well as the open bars in the public areas, you will also be able to relax with your favourite drink in your suite. The complimentary mini-bar will be fully-stocked with your chosen wines and spirits and the veranda (featured in 90% of suites) offers the perfect place to savour your selection. Seabourn’s award-winning cuisine will punctuate your day and provide you with some treasured memories around the table. High-quality ingredients are used to create flavours that dance on your palate, giving you a taste of the region you are visiting. There are no restrictions as to where and when you can choose to dine, with a range of different venues to suit your mood and taste. The Restaurant is the main dining area, offering a la carte dishes prepared by the talented chefs and served in a sophisticated setting. Alternatively, Restaurant 2 features tasting menus of smaller plates with a distinctly modern feel. More relaxed, buffet options come in the form of The Veranda Café and Colonade, meaning you can start or end the day with plenty of choice. There is indoor and outdoor seating, so you can take advantage of the beautiful weather and enjoy your meal al fresco. As well as the enriching shore activities, there is plenty happening on the ship during those lazy sea days. The well-equipped fitness centres offer complimentary yoga and Pilates, or you can choose to do your own workout on the cardio and weight training machines. If you would rather indulge in a sumptuous spa treatment, the relaxing Spa at Seabourn invites you to try a range of different therapies that can be tailored to your needs. The library offers a quiet area for reflection and there are scheduled educational talks and food and wine tastings for you to take part in. As the evening approaches, guests choose to gather in the lounges for a casual drink or pre-dinner canapés. After dinner, you can dance the night away in The Club or opt to be serenaded by the piano music in the Observation Bar. If the silver screen is more your thing, Movie Under the Stars® will entertain you on the top deck and Evening Under the Stars® will offer some live music. When in port Seabourn have a wide range of shore excursions available. Why not explore the hidden treasures of the Ancient World in Petra, visit in Kintami volcano in Bali or have a shark and stingray encounter in Bora Bora. Experience village life in India, meet elephants in Sri Lanka or take a cable car ride in Dubrovnik. Alternatively you can order a private vehicle and driver to give you a private tour of the area.